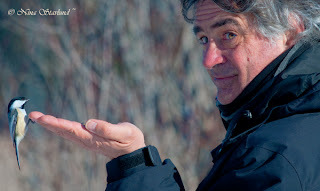 ~ The Visual Adventure ~: Bird Walk @ Jack Pine Trail, Ottawa, March 15th. Bright sunshine with blue skies, and spring migration all around us, hiking along the Jack Pine Trail today revealed many species, like Black-capped Chickadees, Blue Jays, Hairy and Downy Woodpecker, just to mention a few. Canada Geese were frequently flying over head, and Redwinged Blackbirds were busy claiming their new found territory. 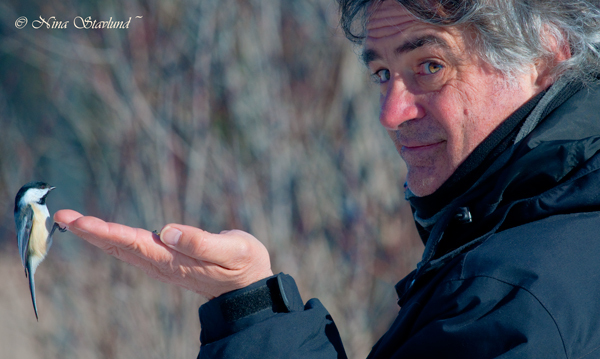 After completing the trail and getting our fill of hand-feeding the smaller birds, we went to the Burnside Pit. There we saw about 600 Canada Geese, and a good mix of about 800 Ring-billed, Herring and Great Black-backed Gulls resting on the ice. Tony spotted 3 Glaucous Gulls and a Cackling Goose. A couple of Red-tailed Hawks were perched looking at all the incoming traffic of Gulls and Geese. To end the excursion we went to the Hilda Feeder at Shirley’s Bay. There we saw a wonderful mix of Common Redpoll, American Tree Sparrow and Red-winged Blackbirds. In all this chaotic activity at the feeder, Tony spotted 3 Hoary Redpolls and a Leucistic Common Redpoll for us all to photograph. Spring migration is all around us! Great recap, Nina, sounds like it was a sweet day indeed. I certainly wish I could have been there! 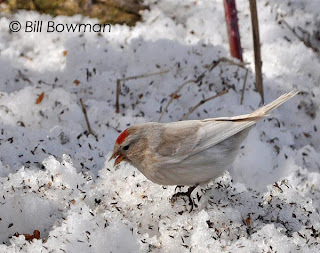 One question about the leucistic redpoll: what makes it decidedly leucistic rather than just a pale individual? I ask because I know redpolls are highly variable in terms of colouring, and I photographed one last month that was significantly paler than the one pictured above, which I thought was leucistic. Just wondering if there is a rough rule for differentiating between leucism and birds who are just pale as a result of variation. Thanks! Hi Jen, thank you for your interest in this. From what I understand Common Redpolls never gets this pale - normally. Yes, they can get very pale, but not this much. The bird shows all signs of being leucistic as it is missing all the streaking and details, and has no pigments. On a normal Common Redpoll, there is a strong contrast between the streaks and the white ground colour of their plumage. On this bird, the streaks are there. But, they are more a light buffy colour, almost invisible against the white ground colour. This is typical leucism. Even though the feathers on this bird are heavily worn, you would expect to see some contrast in the plumage. Even a Hoary Redpoll shows more plumage contrast. In some extreme cases, feathers can become bleached, worn and abraded. However, this bird appears relatively intact.